Ever get frustrated at your cat for always pawing food out of its dish, leaving bits of food all over the place? 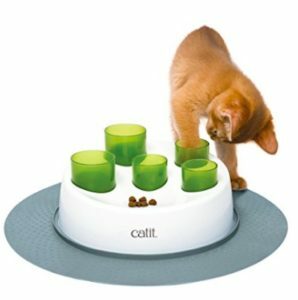 This is the perfect fix for your cat because it taps into their natural instincts to play with their food. 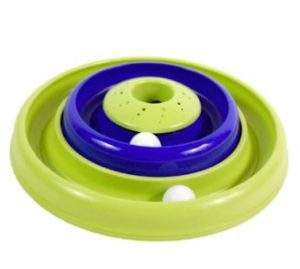 This toy features five tubes that can contain food at the bottom, allowing your cat to pursue its natural inclinations without leaving food all over the place. Both you and the cat can relax with this toy, you’ll love it and your cats will too! Cats love closed spaces. Cats love the sound of crinkled things like plastic bags or tinsel. 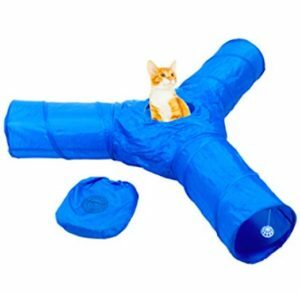 This Tunnel Toy brings those two things together to overstimulate the natural instincts of our feline companions. My three cats have enjoyed this toy, it provides hours of distractions for them, and entertainment for me. It offers opportunities for your cats to perfect their stalking and hiding skills, which most house cats do not get to perfect due to the environment. If you’re looking to offer your cats new stimuli in their environment, and you want to see some hilarious scenes, then this is definitely the toy that both you and your cats can enjoy! Most cat owners understand the following scenario. You come home with your arms loaded with groceries. Your cats, like customs inspectors rummage and rifle through the bags displaying their curiosity and love for plastic bags and anything that sound similar. 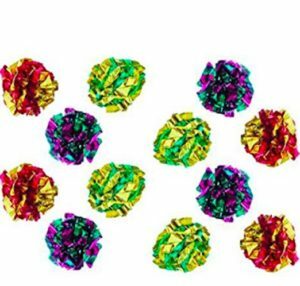 These crinkle ball cat toys offer cats the tactility and the sound that they love about plastic bags. This is absolutely one toy that your cat will play with everyday! It’s a great diversion toy if your cat is doing something you don’t like, or simply if your cat appears to be uninterested in other toys. This is definitely a must have for any cat owner! Jason Galaxy’s line of toys are excellent. He understands the natural instincts of cats, and this toy is perfect. The two balls are not perfectly round, each one has odd angles, which make it more unpredictable to track for your feline. Most balls would roll on a perfect, uninterrupted trajectory making the play value of the toy low. These two balls offer unpredictable trajectories which increases your cats curiosity, interest and replay value. My three cats love these toys above all others for just those reasons listed above. The materials are durable and appear to be resistant to teeth and claws, making them ideal for all cat owners. Monkeys, and their evolutionary superior relative the homo sapient, are not the only mammals who enjoy bananas. 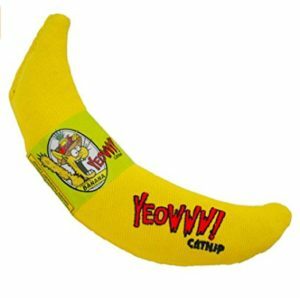 Although, this banana isn’t sweet for either of the previously mentioned mammals because it’s stuffed with catnip! This cat toy is wonderful for the kitten or playful adult cat. Often, when browsing for new stimulating toys for your feline friend, although they see you as a servant, you come across a circular-track toy that has a ball caught within the tubes. 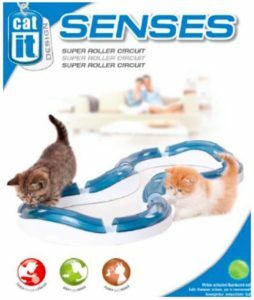 This toy takes it a step further as the circuit has bends and rises, making it more interesting and capable of captivating your cat for hours on end. The ball functions using motion sensor, when it detects motion the ball lights up and race around the track! How fun!! Imagine the delirium you’ll experience as you watch your feline “stalk” this pesky prey! After a long day of lounging around, eating and sleeping, what more do you think your feline desires? They need a “massage center” to stretch out their tired muscles! 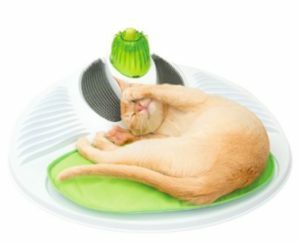 The Catit Senses 2.0 Wellness Center offers a variety of textures and materials to offer your cat for grooming and massaging. All the materials stimulate and isolate different areas of your cat, such as behind the ears, gums, neck/shoulder area, often the hardest to reach places for cats. If you ever went to a wellness center, and experienced the luxury of massages, why not also offer your cat the same luxury? Buy this, and you’re feline will love you even more! 8. 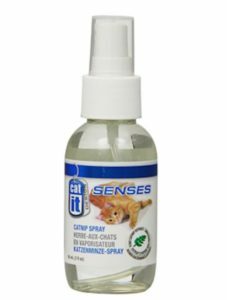 Catit Liquid Catnip Spray, 3oz. Catnip might as well be meow-ijuiana. Cats become hippies and stoners when they smell, rub against and eat catnip. Their activities range from chill to hyper. Just like broccoli, catnip loses its potency after a specific amount of time. Side-step this inconvenience with liquid catnip spray. It’s the perfect material with which to deliver this “feline crack.” It doesn’t mess up your floor, and its potent concentrated form allows a little to go a long way! The Cat Activity Center with Hanging Toys is an excellent toy/apparatus to purchase for your feline companion. When you purchase the feline center, you also receive a bonus liquid cat spray! This apparatus features four hanging cat toys that dangle effortlessly right at eye level with your cat, and within reaching distance when your cat lays down on the center’s soft, comfortable base. This Cat Activity Center is perfect if your cat is regularly home by him/herself (themselves) for hours on end as you crush it at work. The Cat Activity Center with Hanging Toys is perfect for helping kittens improve their coordination and for your older cats who may need more movement in their daily life. The center itself is 24 inches tall by 23 inches wide, and comes in two colors. It is for all these reasons and more that you should certainly pick up this activity center for your feline today! One toy that you probably already have is a cheap plastic cat pole. You know, it looks like a fishing pole, but instead of a hook and bait you have a furry little animale on the end of a string. Well, it’s fun to play with your cat with this toy, but what happens when your arm gets tired but your cat is still energetic? 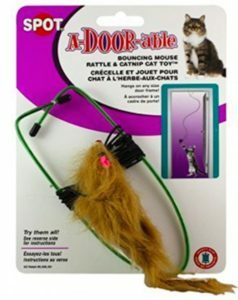 Exactly, you click on this “A-Door-Able” cat toy and let your door do all the work as you relax and watch tv! 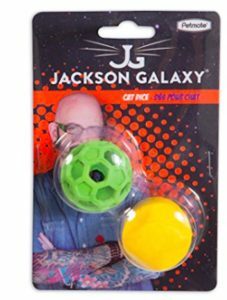 This toy will keep your cat entertained for hours while you sit back and watch the game or as you binge watch your favorite series on Netflix. No need to keep your cat entertained, let your door do the job! This cat “a-door-able” toy will also help you to keep your cats from meowing incessantly at your door when you banish them from you or your children’s bedrooms! The Bergan Catnip Hurricane Cat Toy is simple yet refined. In cat world it’s also a dispensary for liquid or leaf catnip. 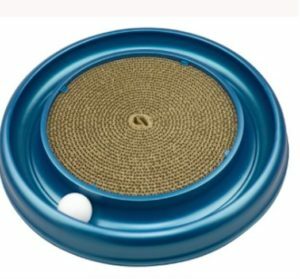 This toy features two tracked-balls and a hollow space in the middle intended for catnip. When you place the catnip in the center and then put the balls in motion, they serve as a vehicle for dispersing the catnip scent. Once your cat figures this out, they can auto-stimulate themselves with catnip without you even needing to do a thing. This toy is perfect when you need to distract or offer a new element in your feline’s environment. My three cats love this toy, and they’ve played with it so much to the detriment of their other toys. Suffice it to say, that this toy has literally saved many objects in my house from claws. The Bergan Turbo Scratcher Cat Toy is similar in design and concept as their Catnip Hurricane, yet different in purpose. This toy features a one-track ball encircling a cardboard scratching surface. This item is perfect for you if you want your cat scratcher to have a low profile in your living room, or any room for that matter. The apparatus itself is 16″ in diameter and the cardboard scratching surface can easily be replaced; replacements can be found online or in most pet stores, making this toy a very convenient one indeed! You ever hear your cat cough and then moments later (or days) you find a neat little hairball on (under/in/around) your bed or other furniture? Well, cats love to groom themselves as much as humans love showers. A cat’s tongue has hundreds of mini hooks covering it, just like velcro does. Well, these hooks collect hair and eventually there is too much stuck in your cat’s throat and they end up coughing it up! Cat grass is an all-natural way to help your cat get ride of their hairballs and it helps in digestion. You see, cats (and dogs) if allowed to go outside will naturally eat grass on a daily basis. But if you have an indoor cat, they can’t benefit from this natural instinct. 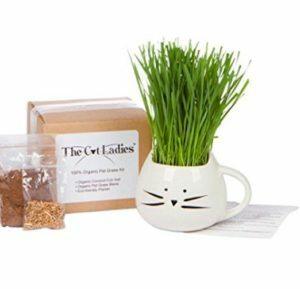 With this 100% Organic Grass Kit from the Cat Ladies, you can provide your feline with an all-natural method of controlling hairballs while aiding in digestion. You’ll start to notice how much your cat loves this “toy,” and you’ll start to see a difference over night! Do you and your cat a healthy favor and pick this toy up as soon as you can!